Though Windows Media Center Edition and the Windows Media Player are very good at what they do, there's no native support for iTunes file types. Though this is hardly surprising given the competition between Apple and Microsoft, it's a bummer for those that shop at Apple's popular iTunes online store. In steps MCETunes (various pricing, free demo), a plug-in for MCE that lets you access your iTunes media from within MCE's ten-foot interface (what you see when you're ten feet away an using a remote control). There's not a whole lot to describe beyond that. 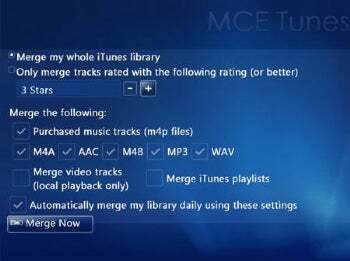 After installing MCETunes, head to the More Programs section of Media Center, run MCEtunes, then tell the program whether to import everything from iTunes or specify only AAC, mP4, music, video etc. I opted for everything and everything I got. MCETunes has to launch iTunes to do this if it's not running. The standard version of MCEtunes worked fine for me. I didn't test the Pro version, which is required to play iPod/iPhone mp4 video. However, my mp4 copy of Kung Fu Panda did show up on the video list and all the .m4a format music played just fine. The demo version will only import 20 tracks. Note: MCETunes will play protected content only on the computer on which it's authorized.